Trust our Haunted Legends The Curse of Vox Walkthrough to assist in your investigation of the murder of Sylvia Filler's brother and the theft of his most prized possession, a mysterious book. Use our detailed instructions, our simple puzzle solutions, and our beautifully marked custom screenshots to ensure you're always one step ahead in this ghostly inquest. Oh well, might as well make the most of it. It certainly lends itself well to exploring a haunted house packed full of ghostly spirits like the one in this new Haunted Legends game. But don't worry, we're not going to let you go wandering off into this haunted house all alone. 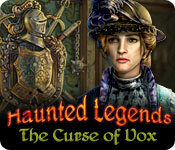 In fact, we've just put the finishing touches on our very own Haunted Legends Curse of Vox Walkthrough! Between trying to solve the murder of Sylvia Filler's brother, searching for his stolen book, and trying to figure out what the heck that strange, creepy little man is up to you, you're going to have your hands full in this spooky hidden object adventure game. 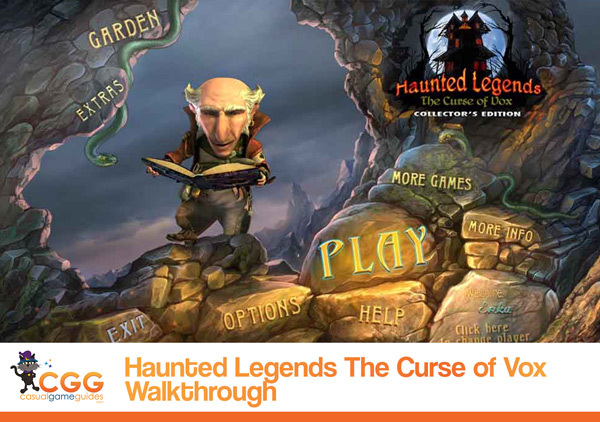 So when you find yourself in a precarious situation, and you don't know where to turn, rely on our trusted chapter-by-chapter instructions, our beautifully marked screenshots, and our simple puzzle solutions in our Haunted Legends Curse of Vox Walkthrough to help clear the way for success!